The County Executive and County Council President have spoken out against calls to lower rates on the ICC, while some incumbent members of the General Assembly are touting their record of having raised gas taxes in order to fund mass transit projects. Both County Executive Ike Leggett and Council President Craig Rice condemned calls by candidate for Governor Larry Hogan to lower ICC toll rates or create a commuter plan, according to a report on WTOP. Larry Hogan said he favored reducing rates on the ICC across the board. "By lowering ICC costs across the board, we'll save Montgomery and Prince George's residents money, reduce congestion and through increased usage, we'll boost state revenue," says Hogan campaign spokesman Adam Dubitsky. There have been previous calls by some democrats, including Doug Gansler and Council Member Phil Andrews for toll rates on the ICC to either be lowered or for a commuter discount to be enacted . Both made bids for governor and Montgomery County executive, respectively, but lost the democratic primaries. However Council President Craig Rice (D, council district 2) opposed the idea of a rate reduction. "To take money out of the coffers, that's a decision that has to be heavily weighed. It's not as simple as offering a discount, where is that money coming from?" asks Rice. "I think when we look at the overall numbers of people using the ICC, the numbers are positive. I think the utilization is right where it needs to be, although others may disagree. Why offer a discount for a road that is meeting expectations?" Candidate Anthony Brown would make no promise rate reductions. "A Brown-Ulman administration would be committed to a comprehensive tax review in order to provide relief to working families, but we are mindful that tolls are set by an independent commission so politicians can't make unsustainable promises in an election year," says Brown campaign manager Justin Schall. Toll rates for all facilities are set by the Maryland Transportation Authority, an un-elected body which is appointed by the governor. Thus the decisions made by the MDTA about toll rates are ultimately the responsibility of the Governor. The "independent commission" appointed by the O'Malley-Brown administration raised toll rates on previously existing facilities, with MDTA toll revenues from existing facilities increasing by 75% in only four years. In fact the MDTA suggested in financial projection documents that ICC toll rates could actually go up in coming years, since rates would be set to limit traffic on that road. "the timing of any toll increases on the ICC and I-95 ETL projects will depend primarily on the need to manage congestion on those facilities, and thus toll rates on those facilities could be adjusted during the six year period, should conditions warrant" wrote the MdTA., making clear that the MdTA specifically does not consider relieving traffic from other roadways to be part of the purpose of the ICC project. The ICC currently sees about 45,000 cars per day, a tiny fraction of the about 200,000 per day which travel many portions of the Beltway. According to WTOP Montgomery County Executive Isiah Leggett and Councilmembers Craig Rice, Hans Reimer "were among those to urge voters that Lt. Gov. Anthony Brown is the only candidate who'll ensure the Purple Line is built. 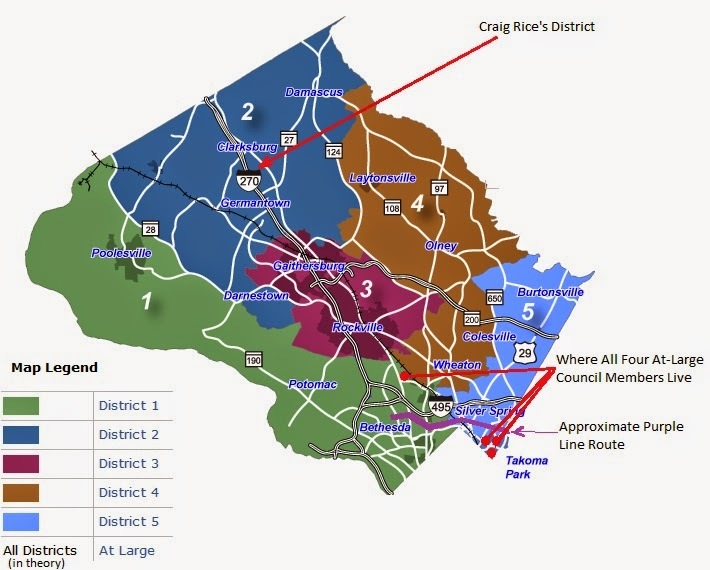 The Purple Line is a light-rail line that will connect Bethesda, Silver Spring, Greenbelt, College Park and New Carrollton. It will link up Metro's Red, Green and Orange Lines in an east-west route. 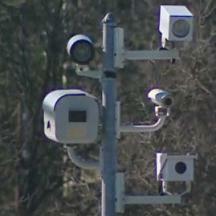 Construction could begin in 2015; service could begin in 2020." Rice's expression of support for the $2.4 billion transit project is despite the fact that the purple line would be of little use to members of Craig Rice's district, since no portion of it's planned route is within council district 2. The rail line has been very popular with some of the at-large members of the council such as Hans Reimer. Currently three of the four at-large council members (who in theory represent the entire county) are from Takoma Park, the fourth from nearby Garrett Park. No at-large members are from any portion of Upcounty or Mid-County. "I can say there are four people who are up here who are seeking your vote tonight, as opposed to the incumbents who either don't want your vote or assume they already have it in the bag. They really embarass themselves by being an empty chair tonight, but then again it's a perfect representation of what their leadership has been for the last 4, 8, or 12 years. If I were them or maybe if you were them you might be running away too since we know that BRT [bus rapid transit] will demolish 150 businesses and homes between here and Wheaton, they haven't attracted a large corporation to the county in over a decade, and they have the worst congestion in the nation in traffic"
Larry Hogan stated in an earlier press release that the thought roads should be the priority for transportation spending. "O’Malley and Brown picked the lock on the Transportation Trust Fund and siphoned off nearly $1 billion in our gas taxes to balance their bloated budget. Then they passed massive gas and diesel tax hikes only to invest the majority of the money in mass transit projects instead of fixing our crumbling and congested roads and bridges."... "“Under a Hogan administration, the Transportation Trust Fund will be used as it was intended: for roads and highways." Meanwhile, incumbents in Montgomery County Legislative District 15 are promoting their record of having raised taxes on motorists, without promising new or improved roads and instead proposing new bus routes as the solution for commuters. The incumbent slate of State Senator Brian Feldman for state senator, and State Delegates Kathleen Dumaise, David Fraser-Hidalgo, and Arun Miller for state delegates recently sent out a mailer promoting their record transportation (all democrats). The Mailer stated that the District 15 Team "Supported the Landmark Transportaion Infrastructure Act which increased State transportation funding", without stating that this increase in revenue was coming from an over 80% increase in the state gas tax which is currently being phased in. The mailer goes on to state that the team "Advocated for priority funding foor the Corridor Cities Transitway (CCT) to increase mass transit option from Shady Grove to Clarksburg/Upcounty to help Upcounty gridlock". The CCT would be a new "rapid" bus transit route which would wind from Germantown to Kentlands to Shady Grove. Despite having voted for the massive gas tax hike, the District 15 slate's mailer did not mention any proposals for new roads, or widening any existing roads in District 15. District 15 is the geographically largest, and least urban, legislative district in Montgomery County, including areas such as Poolsville and Barnesville and other up-county regions where transit is not and cannot be a workable solution for many commuters. The district 15 incumbents are running against challengers Robin Ficker for senate, and Flynn Ficker, Ed Edmunston, and Christine Thron for Delegates. Some challengers have proposed substantial new road improvements, including the Fickers who stated they would seek to widen I-270.